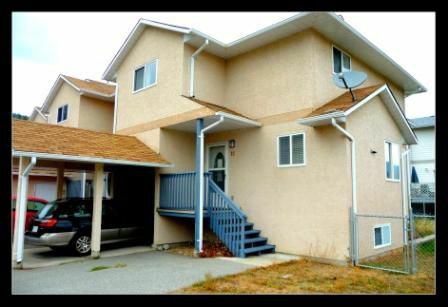 This well-kept townhouse is located in a family-oriented complex on a quiet street in Okanagan Falls, approximately 20 minutes drive to Penticton or Oliver. Only 2 blocks to the beach & steps to tennis court & school, it has a landscaped fenced yard for the kids to play in safely within view from the home. The spacious floor plan offers a cozy gas fireplace in the living room, a deck off the main living area perfect for year round BBQ & has 3 bedrooms upstairs. The Master Bedroom has a 2-piece ensuite & private balcony to enjoy the wonderful Okanagan weather. Enjoy the large basement family room with newer flooring, 3-piece bathroom & workshop. Enjoy the kitchen hardwood cabinets, island, pantry & separate laundry room. C/A, central vacuum & bright open floor plan are some of the extras this property has to offer. This townhome is clean, well-maintained & will show well. All measurements approx. Schedule A required with all offers. Court approval not required.